Diagram of the working memory task showing the event order and trial types. Three categories of trials, defined by the type of distracters presented during the delay interval, were involved. Each trial contained two distracters of the same type, which were consecutively presented for 3 s. Subjects were instructed to encode and maintain the memoranda into working memory, look at the distracters, and then indicate by pressing a response button whether the probes were part of the memoranda (1, yes; 2, no). Brain-behavior relationship showing the direct link between brain activity and memory performance. A, As illustrated by the bar graph of the corrected recognition scores (Hits-FAs), emotional distracters had the most detrimental effect on working memory performance. B, Paralleling this behavioral pattern, emotional distracters had the most disrupting effect on the activity during the delay period in brain regions typically associated with active maintenance of task-relevant information in working memory (e.g., dlPFC). C, Mirroring these effects, emotional distracters had the most enhancing effect in brain regions typically associated with emotional processing (e.g., amygdala). Hits, Correctly identified old probes; FAs, incorrectly identified new probes (false alarms). Error bars represent SEM. Dorsoventral dissociable patterns of activity in the presence of emotional distracters. Emotional distracters produced the most disrupting effect on the activity during the delay period in a set of dorsal brain regions associated with cold executive processes (the blue blobs) while producing the most enhancing effect on activity in a set of ventral brain regions associated with hot emotional processing (the red blobs). 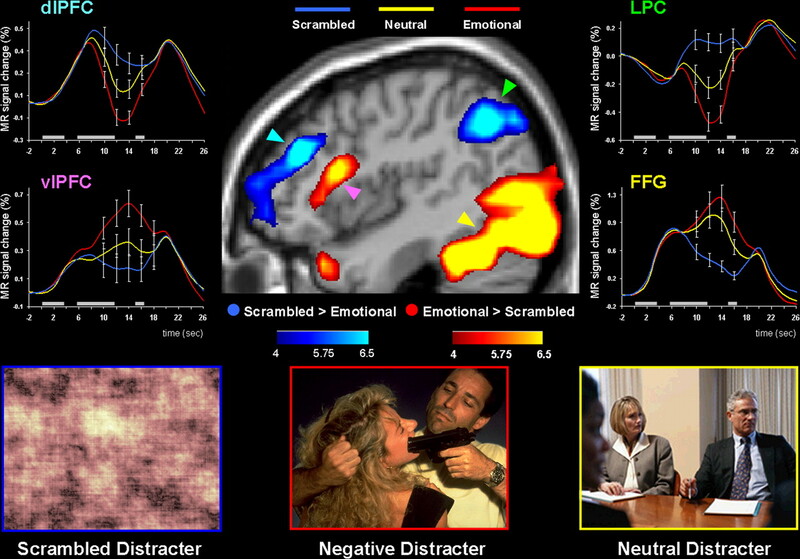 The central image shows activation maps of the direct contrasts between the most versus least distracting conditions (i.e., emotional vs scrambled), superimposed on a high-resolution brain image displayed in a lateral view of the right hemisphere. The colored horizontal bars at the bottom of the brain image indicate the gradients of the t values for the activation maps displayed. The line graphs show the time courses of activity in representative dorsal and ventral brain regions (indicated by color-coded arrows). The gray rectangular boxes above the x-axes indicate the onset and duration of the memoranda, distracters, and probes, respectively. FFG, Fusiform gyrus. Right-lateralized patterns of frontal activity in the processing of emotional distracters. Consistent with the role of the right hemisphere in the processing of negative emotions, emotional distracters were associated with a right-lateralized pattern of activity, which was more pronounced in the lateral prefrontal cortex. The activation maps displayed in a coronal view show greater effects of emotional distracters in the right (R) hemisphere than in the left (L) hemisphere. For display purposes, a higher t threshold was used, and hence only activity in the right hemisphere is shown. However, emotional distracters also produced significant effects in the left hemisphere (Table 1) (bar graphs). The bar graphs illustrate the peak delay differences in brain activity between the three experimental conditions in the right versus left hemispheres. The ANOVAs confirming this right-lateralized pattern are performed on percentage signal changes in the MR signal extracted from functionally defined ROIs, which were traced in homologes dorsal and ventral regions from both hemispheres. Error bars represent SEM. Greater correlation between the vlPFC activity and the distractibility scores for emotional than for neutral distracters. The left panel shows a subregion of the right vlPFC (BA 45; Talairach coordinates: x = 60, y = 18, z = 18), the activity of which in the presence of emotional distracters highly correlated with the subjective scores for distractibility. Similar effects were also identified in the left hemisphere (BA 45/46; Talairach coordinates: x = −50, y = 27, z = 13), in which the same correlations were significant for emotional distracters (r = −0.68; p < 0.005) but not for the neutral distracters (r = −0.001; p > 0.99). The correlation map was obtained by calculating across-subject voxel-based correlations on the MR signal from the vlPFC voxels that showed greater activity during the delay period for emotional than for neutral distracters at p < 0.005 (t > 3.0). The scatter plots illustrate the results of the correlations calculated on the averaged MR signal extracted from clusters of voxels showing significant correlations at p < 0.005 (R > 0.64). The colored horizontal bar at the bottom of the brain image indicates the gradients of the R values in the correlation map. t values of paired contrasts between the conditions of interest as a result of whole-brain voxel-based analyses (p < 0.001; t > 3.79) are shown for typical dorsal executive and ventral affective brain regions. The x, y, z coordinates denote the location of the peak voxel in Talairach space (Talairach and Tournoux, 1988). The effects identified during the delay interval typically peaked between 12 and 16 s after the onset of the memoranda (TRs, 6–8 after onset). Emo, Emotional; Neu, neutral; Scram, scrambled; R, right; L, left; M, middle; pCG, posterior cingulated gyrus; BG, basal ganglia; cn, caudate nucleus; sgCG, subgenual cingulate gyrus; HC, hippocampus; Hthal, hypothalamus. ↵aSignificant at p < 0.005 (t > 2.97). supplemental material - Figure Caption Figure 1. The effect of emotional distracters on activity in brain regions showing greater response to successful that to unsuccessful trials. Confirming our predictions, specific regions of the dorsal executive system showed greater activity to correct than to incorrect responses. Moreover, the emotional distracters associated with incorrect responses produced the lowest level of activity in the dlPFC (BA9). 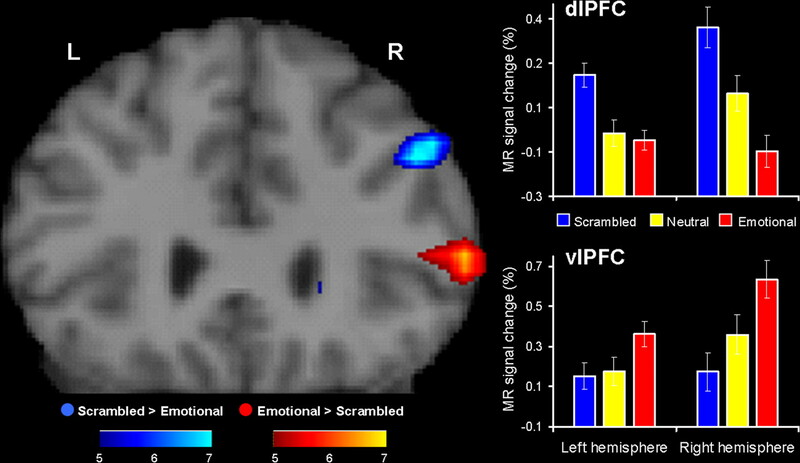 The left panel shows an activation t map of the direct contrasts between activity for the correct and incorrect trials, superimposed on a high-resolution brain image displayed in a coronal view. The line graph shows the time course of brain activity from the dlPFC region highlighted by the white circle, in which incorrect emotional distracters were associated with lower levels of activity than the incorrect trials of both neutral and scrambled distracters. Supporting this idea, a one-way ANOVA computed on the % change in the MR signal associated with the incorrect responses of the three distracters (emotional vs. neutral vs. scrambled) yielded a significant main effect of distracter (F(2, 9) = 5.29, p < 0.02). Post-hoc analyses further confirmed that the incorrect emotional trials produced lower level of activity than both the incorrect neutral trials (p < 0.05) and the incorrect scrambled trials (p < 0.006). The greatest difference occurred 12 sec after the onset of the memoranda (marked by the dotted line). The grey rectangular boxes above the x axis indicate the onset and duration of the memoranda, distracters, and the probes, respectively. dlPFC = dorsolateral prefrontal cortex, BA = Brodman Area; Emo = Emotional; L = Left, R = Right. Additional dorsal executive regions showing greater delay activity for the correct than for the incorrect trials included sub-regions of the dlPFC [BA46, x y z = -46 21 28, T(9) = 3.4, 0.002], basal ganglia [putamen, x y z = 24 16 -1, T(9) = 6.4, p < 0.0001], and cingulate gyrus [BA32/24, x y z = -8 32 24, T(9) = 6.2, p < 0.0001; BA31, x y z = -8 -25 34, T(9) = 3.8, p < 0.001].